Wondering how to tap into the mindset of abundance? Struggling to establish boundaries? Are you secretly a network marketing snob? Don’t worry – we’ve got you covered! 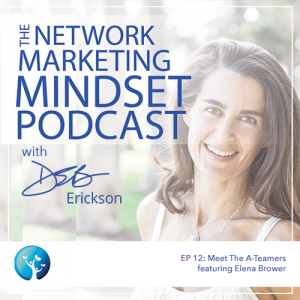 On this week’s episode of Meet the A-Teamers, Deb talks to doTERRA Presidential Diamond, mama, author, teacher, and speaker Elena Brower. Listen now for all the wisdom Elena and Deb have to offer! Once you’ve finished listening, download your free copy of Every Thought Counts. Also, don’t forget to check out our Gold Membership, filled with resources for entrepreneurs like you. Want to know more about Elena? Check out her website, which includes her Essential Practice, which is packed with resources to help motivate your team and grow your business. Elena is a Mama, teacher, author, speaker, and Presidential Diamond leader with doTERRA, and has taught yoga since 1999. Her first book, Art of Attention, has been ranked number one in design on Amazon and has been translated into six languages. Elena’s second book, Practice You: A Journal, is a bestseller from Sounds True, now being incorporated into teaching curricula worldwide for all ages.